Knowing that there was a need for connections in rural areas, AlignTec came into being with the drive to bring reliably fast internet service to Southwest Colorado. 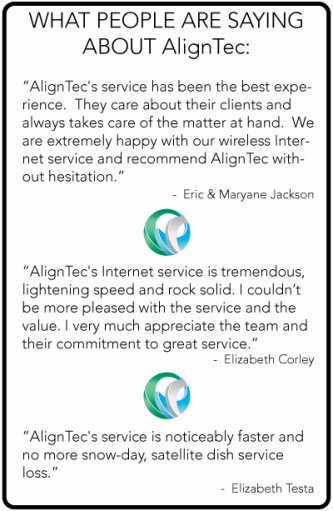 We are passionate about providing the strongest internet connections to rural Colorado. Specializing in residential internet, plans start at 3Mbps and go up to 50Mbps. “Smokin’ fast internet” is our slogan, and it shows. We’re growing fast and working hard to continue expanding our coverage! If you haven’t heard of us before, you have to give us a shot. People are consistently surprised by the level of care and coverage we provide our customers. Unlike the internet providers you might be used to, we aren’t subsidized by lobbyists or government money meaning our own skin is right in the game. Starting as a tech services business in 1996, we evolved into an internet broadcaster in 2004. In 2013 we went through a rapid expansion, allowing us to provide wireless internet networks throughout La Plata County. The quality of our service is unrivaled! Will We Work for You? Request a site survey and one of our professional team members will visit your property to determine what services we can provide you, all at no charge. We don’t want you to pay for anything we can’t offer. That’s why we want to make sure we can honestly deliver the services we offer.